(The Root) — After months of running one of the most gaffe-plagued and widely mocked presidential campaigns in modern history, former Massachusetts Gov. Mitt Romney delivered a debate performance that may not have been a bona fide knockout, but was definitely a winner — at least with certain voters. Romney looked relaxed, confident, even likable — all qualities he has struggled to convey in recent months. President Obama, on the other hand, looked and sounded exhausted. That's understandable, given the fact that he's busy doing full-time jobs, including a pretty big one (you know, being president) and another pretty big one (you know, running for president). While Romney's answers flowed freely, the president often seemed to be searching for his. The end result? Romney enjoyed a clear victory, particularly with male voters, if the CNN instant poll tracking the reactions of undecided voters was any indication. Similarly, whenever Romney mentioned the word "jobs" — which he mentioned about as many times as the president mentioned "middle class" — male undecided voters appeared to react extremely positively, much more so for him than they did when the president discussed the economy. I have written before of President Obama's struggle with male voters, particularly white male voters. The bad news for the Obama campaign is the president likely didn't win them over during the first debate. 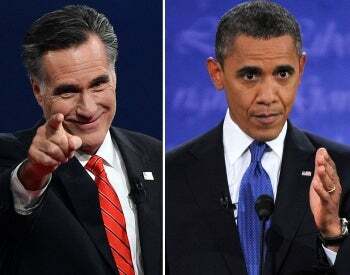 One: There are two more matchups with Mitt Romney. Two: Women voters, who are largely credited with keeping the Obama campaign afloat so far, are unlikely to abandon him after tonight's performance. The president's delivery, tone and body language clearly left a lot to be desired (even his own team is unlikely to deny that), but he hit a number of high notes that resonate with women. That doesn't mean the president "won" with women tonight, but in a campaign, not losing a significant part of your voting base to your opponent can be just as important as winning over additional voters.